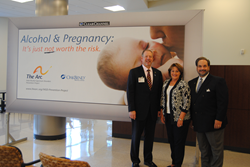 OakBend Medical Center is the first and only hospital in the United States to join forces with The Arc of Fort Bend and The Arc of the United States to form a partnership to educate healthcare providers and the community about Fetal Alcohol Spectrum Disorder (FASD) prevention. Statistics show that one in 13 women say they drank alcohol while pregnant, resulting in one in every 100 children in the United States having an FASD. Fetal Alcohol Spectrum Disorder (FASD) is an umbrella term describing the range of effects that can occur in an individual whose mother drank alcohol during pregnancy. These effects may include physical, mental, behavioral, and/or learning disabilities with possible lifelong implications. According to the Association of Reproductive Health Professionals, alcohol, no matter what kind, is a teratogen which is a known agent or factor that causes malformation of an embryo. When a pregnant woman drinks alcohol, so does her unborn child and there is no known safe amount of alcohol during pregnancy. The Arc’s message is, “It’s just not worth the risk.” However, if the woman has had alcohol during pregnancy, it is never too late to stop drinking. OakBend Medical Center is an independent, community-minded health care organization located in the heart of Fort Bend County, providing quality care and exemplary service with its two full-service hospitals, as well as many specialty centers. For more information, please go to http://www.oakbendmedcenter.org. Connect with us on Facebook, http://www.facebook.com/OakBendMedicalCenter and follow us on Twitter at http://www.twitter.com/OakBendMedical.